Then the question was, how could I listen to them? My workaround pre-minidisc was to plug my brother's FM transmitter into the back of our PC, and then record the songs off the radio using my dad's portable stereo. We didn't have any cassette recorders with a line in that I was aware of. 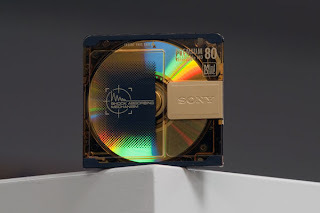 When I decided to get a minidisc recorder, I had to get permission from my parents, because it was a lot of money to be spending for a kid my age. My dad asked me how I knew it would still be any good in a few years. What if the minidisc format didn't take off? Well the joke's on him. Look at our world today. Nearly all music bought and sold is on a minidisc, so we certainly proved him! Look, I didn't know whether or not minidiscs would take off, and I didn't really care. That was beside the point, and didn't factor into my decision at all. I wasn't planning on buying any minidisc albums. This isn't because I was just going to pirate music--I did manage to make it to that decent record store every now and then, and all my CDs were ripped and put on minidisc immediately. It was it's own ecosystem. I had enough blank minidiscs to last me a while, and if I started to run out I could phase out music I wasn't listening to anymore. This just pops in my head because I've been looking at tablets a lot lately. The truth is, I can live with Android, but I still don't know about it. I mean, it seems limited as a platform, compared to Maemo/MeeGo, which I unfortunately will be comparing every mobile OS I ever see for the rest of my life to. I don't care about user adoption and the number of apps, I care about whether or not I can someday soon use a tablet instead of a pen and paper without ever looking back, the same way I've never looked back to cassettes. If I can, then I don't care about future updates or upgrades. It's an investment. I used minidiscs long after mp3 players became prevalent. Minidisc worked for me at the time so I didn't have to look around for a better system. Are tablets at that point yet? I feel like they almost are. They just...almost are. Somebody give me a thousand dollars and I'll find out for sure pretty damn quick.